Hello dear friends! I hope you've had a lovely weekend! Today I have a fun patterned birthday card to share with you for this week's Cupcake Inspirations Challenge. Today's challenge is a birthday theme. How fun! I started by printing out my image from Wags and Whiskers on some fun chevron DSP from I Am Me. I paired it with some Birthday Basics DSP and some Basic Gray card stock. I colored in some fun accents in the image - the party hats, present and wee mouse, Squeak. I'm still torn on whether or not I should color in Ellie, the elephant. I think she might look okay, but my coloring skills aren't so fabulous and you know that once I start, there's no turning back... For now, I'm liking her chevron pattern. Then I embellished the card with some Pool Party Baker's Twine, some designer buttons, and the Chalk Talk stamp that I embossed in White on some Basic Gray card stock and die cut with the coordinating die. Hope you like it and are having a fabulous day! 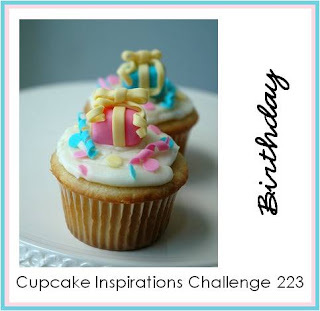 Be sure to stop over at the Cupcake Inspirations Blog for some more fun birthday cards that our sweeties have designed. Then, won't you create a sweet birthday card and link up with us? We'd love to see what you create! Nina, Love the chevrons and how you printed the elephant on it! This is so cute! Love the buttons that pull out the dots on the pattern paper!